Our hands are used to perform many necessary functions. Hand weakness or pain can be debilitating and limit a person’s ability to dress, drive and more. For those that do not benefit from conservative approaches to treating weakness, injury or pain, hand surgery specialists provide additional options to address specific conditions affecting the hands and wrists. There are a number of benefits from seeking the option of hand surgery specialists and receiving treatment at the Jacksonville orthopedic unit. Learn why people with hand pain or limited range of motion turn to a hand surgery specialist. 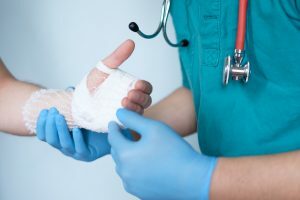 A Jacksonville hand surgeon is an expert in addressing the various conditions that can affect the hand, wrist and forearm. They often use non-invasive or minimally-invasive measures to diagnose and treat conditions. When more invasive surgery is called for, hand surgeons have the expertise and training to operate on the delicate soft tissue, nerves and bones making up the hand and wrist. An injury to either the hand or wrist. A hand surgeon may suggest acupuncture, physical therapy or stem cell injections as part of your treatment options. Understand more about the range of options available to effectively address problems of the hand or wrist. Hand surgery specialists have the advanced training to treat trauma, injury and advanced diseases affecting the hand and wrist. Patients can receive treatment for hand weakness, pain or limited range of motion. Speak with an orthopedic hand specialist to learn more about your treatment options today.